In Victoria Harbour, Hong Kong, we find several people snapping photos of each other amidst a small collection of large rubber ducks. These are some of the many shoppers and tourists who frequent the Harbour City shopping centre, which is is built on the site of the Hong Kong and Kowloon Wharf and Godown, one of colonial Hong Kong’s original commercial wharfage complexes. The shopping centre features many luxury brands, such as Louis Vuitton, Prada, Versace, and Hugo Boss. It also has largest Toys “Я” Us in Hong Kong. 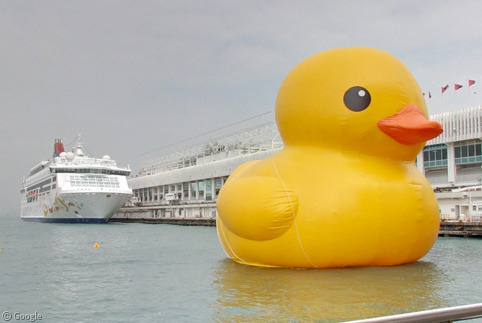 Actually, come to think of it, there are quite a lot of rubber ducks here, and some of them are really pretty big. Explore a bit further amongst the (really rather cute) ducks, and what the…!? 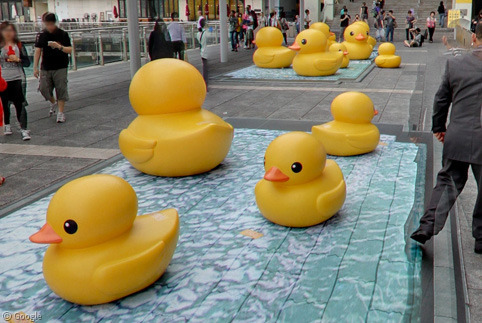 And so, 6 years after its first appearance, artist Florentijn Hofman’s world-famous Rubber Duck sculpture has finally been captured on Google Street View. 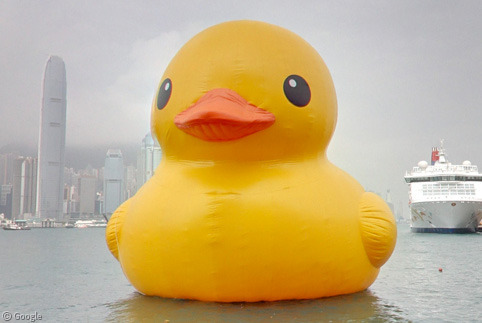 At 16.5 metres, the Hong Kong duck was actually the second-largest in a series of giant ducks. 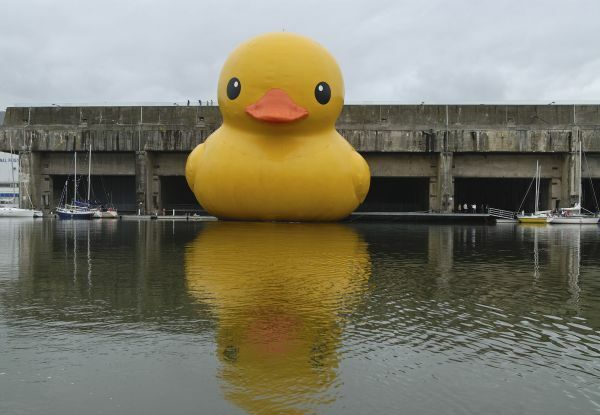 The largest in the series (the world’s largest rubber duck) was exhibited at Saint-Nazaire, France in 2007 – and stood 32 metres-tall. Together the ducks form part of the “Spreading joy around the world” tour, which has visited nine countries so far, including Holland, Belgium, Japan, Australia, and Brazil. 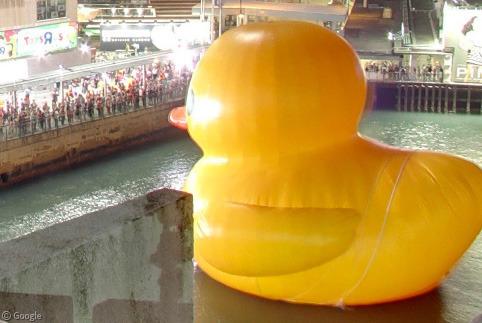 The duck exhibited in Hong Kong was due to be there from 1 May until 9 June 2013, but unfortunately deflated unexpectedly on 15 May. Luckily, each of the giant ducks has a built-in fan, and five days later it was back on display. 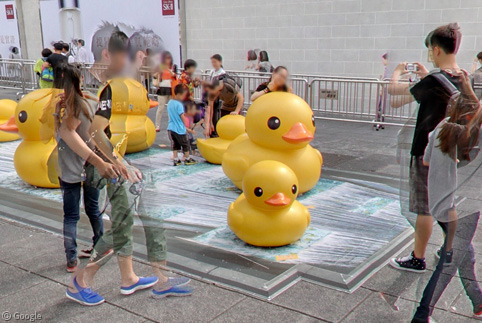 And – as we can see from this Street View image taken from the roof of the adjacent Ocean Terminal shopping complex – the giant duck proved extremely popular with visitors. Florentijn Hofman says that his ducks are designed to “recall everyone’s childhood memories”, and whether they succeed or not, we think the Rubber Ducks are completely and utterly awesome. If you’re near Pittsburgh, Pennsylvania this month, then you can see one of the giant rubber ducks for yourself when it launches the third Pittsburgh International Festival of Firsts on September 27th.